DESTREHAN, La. – Devon Walker doesn't remember the pain. He remembers the hit, the numbness and the strange feeling that his arms and legs were floating high in the air. Then he remembers trying desperately to breathe, and the feeling he was drowning, and the realization that he was about to die. On Sept. 8, the Tulane safety sped to make a tackle in the final seconds before halftime of his team's game at Tulsa. He launched himself at an onrushing receiver, his long hair flying behind him, and he hit both his intended target and a teammate coming hard from the opposite direction. He fell and went still. "You're waiting for the hand to move, the foot to move," says Brenda Dickson, wife of Tulane athletic director Rick Dickson, who was there that day. "Come on, let me see something. Come on, move. He didn't move. That was just crushing. I think it destroyed that veil that everything's gonna be OK."
Everything wasn't OK. A doctor who tended to Walker would compare the collision to a car wreck, or when a diver hits an unseen rock underneath shallow water. Walker's vertebrae squeezed against his spinal cord so forcefully that it cut off his breathing mechanism and nearly severed the cord altogether. If it weren't for the quick response of both Tulsa and Tulane medical staff tending to him as his blood pressure fell, Walker would have died on the field. Eight months later, everything still isn't OK. Three hours of surgery fused the bones in Devon's neck and took the pressure off his spinal cord, but severe damage was done. Breathing and speaking returned slowly, but he still struggles with both. It's a tragic story where Devon Walker is now, yet he somehow exudes a calm with the challenge in front of him. That's how he's always been. On a chilly day in this New Orleans suburb, a nurse leans over a wheelchair in the living room of a one-story house. She smiles as she picks up a piece of sushi from a tinfoil tray. Devon Walker opens his mouth and starts to chew slowly. He swallows carefully and turns his head to greet a reporter at the door. "Nice to meet you," he says in a scratchy voice. Walker uses a Sip-N-Puff, a device that allows him to direct his chair by inhaling and exhaling. That's all he can do for now, though he has frequent pain from his nerves starting to fire. He says he can just start to wiggle his toes – a terrific sign. He can move his shoulders – also ahead of schedule. Yet something as simple as scratching an itch can still be maddening. He takes 20 pills per day, and each one is difficult to swallow. "It's a good thing I have pain," he says. "But it's bad." You'd think the first emotion to hit a college football player upon waking up in the hospital after being paralyzed from the neck down would be overwhelming sadness. You'd also think the most painful part of losing the use of most of your body would be missing the ability to run and play. In the case of Devon Walker, you'd be wrong on both counts. Walker blacked out on the field at Tulsa, woke up in an ambulance, and then blacked out again. His mother, Inez, was here in Destrehan, at the Walker home, when the injury happened. She rushed to the TV to see her son's legs sticking out from a mass of paramedics. "Oh Lord," she said, "don't let it be Devon." Then the TV showed her son's face on the screen. "I just lost it," she says. Rick Dickson rushed downstairs from the press box and onto the field. The athletic director quickly made arrangements for Devon's entire family to fly to Tulsa. He called Inez from the hospital as soon as he could to tell her Devon was out of immediate danger. That was the lowest point for her – learning her son came close to dying. She was so, so far away. That's why, when Devon came out of three hours of surgery, the first emotion was happiness: the whole family was there at his bedside. "Devon," his mom told him, "it'll be OK. Mom's here. Everyone's here." Then the awful, grueling work began. Walker was able to communicate only with his eyebrows and the clicking of his tongue. He had weights slung over the back of his bed to keep him still and blankets all over him. Over the course of the first week after the injury, a nation of worried football fans wondered whether he would recover; Walker had no idea he was a news story. His only goal at that point was to survive and learn to speak and eat again. The hardest moment came when his newborn niece, Raleigh, came to visit. The whole family had waited for months for the new addition, and she was born right before Walker went away to fall camp. Now here she was, in the same hospital room, and Devon couldn't touch her, couldn't hold her, couldn't kiss her. He had no way of showing her affection – of showing love. All he could do was feel her skin against his when a relative placed the baby next to his face. "I've never had the feeling of holding her the way I've wanted to," he says. He starts to cry. Walker spent 10 days in Tulsa, and then spent the rest of the football season in a rehabilitation center in Atlanta before coming home for Christmas. He's had little victories, like eating. "Red beans and rice," he says, beaming. Sometimes he'll get Church's or Popeye's on his way back from two hours of physical therapy. That helps too. And he's speaking, though sometime he chokes on his words and has to pause to swallow hard. It looks frightening – seeing him fight for breath, watching him inhale so forcefully – yet Walker always seems calm. Always calm. There have been a million chances to give up; Devon hasn't. Just the opposite: he seems recommitted, stronger over time. He shows little self-pity, if any. He explains matter-of-factly that it's frustrating when it takes two hours to get dressed in the morning when he used to rush from bed to practice in 20 minutes, tops. When asked how he gets help in the middle of the night when there's no nurse around, he smiles and says, "Mooommmm!!!!" Mom is tired. She feels blessed to have her son alive and at home, but worrying about her son and tending to his daily (and nightly) needs has been overwhelming at times. She smiles easily, like Devon, but the fatigue is in her eyes. Her husband, Devon's dad, is on disability and can't work. She can only hope she keeps the insurance that comes with her job, even though it's her job that keeps her away from her youngest son all day. "It's hard," she says. "Really hard. I want to be here. I can't spend the time I want to spend with him." There is good news, though. Inez Walker has help. Rick and Brenda Dickson have been in constant contact with the Walkers since the injury. Rick rode with Devon to the hospital as the senior's football pads were cut off him. In those terrifying moments, where a young man's life hung in the balance, a bond was cemented. Dickson has strong roots in the Tulsa area – all of his children were born at the hospital where Devon was taken – so he hurriedly spoke to anyone and everyone he knew there. "This one," he said, "is one of my kids." Dickson remained as close to Walker as he could during those frightening hours and days. He was there when Walker awoke, reassuring him that he refused to let the nurses cut his beloved dreadlocks. Walker grinned. Dickson visited Devon at the rehab center in Atlanta, celebrating the good days and sneaking him outside in his wheelchair for a breath of fresh air on the bad ones. He told his staff that at least one member of the Tulane athletic department should visit Walker every week, indefinitely. Teammates came to his side often, and still do, to help him "feel normal." Soon came the idea of "Devon's Den," a huge room added to the Walker family home where Devon could get the kind of technology and resources he would need to heal and connect with the outside world – not to mention a handicapped shower. The cost would be $300,000. Dickson says most of it has already been raised. Even last weekend, as the rest of the school celebrated graduation, there was fundraising for No. 18. Many still walk around campus with a green wristband with "Walker #18" on it. Construction has begun in the Walker's backyard. That's where Devon's Den will be. That's where Devon will watch his niece grow up. The fundraising, however, has almost become secondary to a university-wide devotion to helping Walker get back to school this fall. It's Brenda Dickson who has taken charge of that, working with everyone from professors to technology experts to make the transition feasible. It will not be easy: even a pothole on the drive in can cause Walker intense pain, and low barometric pressure can also bring suffering. A trip to school, like a trip anywhere, will be an ordeal for the rest of Devon's life. "The university will bend over backward to accommodate him as much as possible," Brenda says. "He might be taking business courses, or speech, so he can change directions if he wants to. The goal is [to be on campus] at least once a week, and see if that works." Devon jokes that he wants to take a dance class. It's been eight months since the injury and the New Orleans community is still coming to Devon. Pictures and drawings from little kids make his day. He's met many of the New Orleans Saints, including general manager Mickey Loomis. He spent a few moments with legendary former Saint Steve Gleason, who has ALS. The two sat side-by-side, wheelchair-by-wheelchair, communicating mostly through expressions since Walker struggles to speak and Gleason can no longer talk. All of this has been kept fairly quiet. Photos of Walker and Gleason, as moving as they are, haven't bounced around on social media. Inez wants it that way. Her son hasn't ever been one to seek attention, even when so many people are seeking him out. "I didn't want it where people were exploiting him," Inez says. "He never looked for the spotlight. I wanted it to be like he always lived his life." Yet Walker's personality has always come through without words. As soon as he set foot on the Tulane campus four years ago, he and his family ran into Dickson and proudly introduced themselves. Devon had arrived on an academic scholarship. He was going to study biology, maybe go to medical school, and join the football team. Dickson loved the spirit, but here was a 160-pound kid out of high school, planning on playing big-time football. "I remember looking at this beautiful smile," Dickson says, "and thinking, 'This is great, but I wonder how receptive my coach is going to be.' "
A year later, there was Walker, making tackle after tackle behind Tulane's depleted defensive line. He came off the field in a game against Central Florida and Dickson walked over to him. "How do you like college football now?" he asked. Walker smiled at him just like on the day they met, this time saying, "It's more than I ever thought it could be." Two years later, there was Walker, now a starting free safety and a team captain. He had won over the fans, the coaching staff, and of course the athletic director. He was becoming the face of Tulane football – the perfect student-athlete at a school that requires you to be both a student and an athlete. "We loved watching him bounce around the building," says Brenda. Devon's mom even bought him a Camaro as a gift going into his senior year. He had done so much to earn it. Yet he would hardly get a chance to drive it. The car has only 2,000 miles on it, with a new sound system and headlights. "He still looks at it," Inez says quietly. A couple weeks ago, Dickson visited Devon again, here at the house. They got to talking. Walker was tired, and his nurse helped him into bed. Dickson, still wrapped in the conversation, remained beside him. They are friends now, the top administrator and the injured football player. Sometimes Walker even clicks his responses, in part as a joke and in part because he knows Rick will understand. Dickson knows Devon's DJ name and knows what's in his music collection. He knows Devon's sly sense of humor, and he knows it's OK to laugh when Devon mentions all the injuries he's gotten in games against Tulsa, adding, "Last time we played them, I broke my neck!" As the two talked, Dickson noticed a photo of Walker during his high school playing days. Look how far he had come, he thought, from there to college to earning a scholarship to starting to becoming captain to working toward a degree in molecular cell biology. Physical ability had almost nothing to do with any of it. Devon's power came from inside. 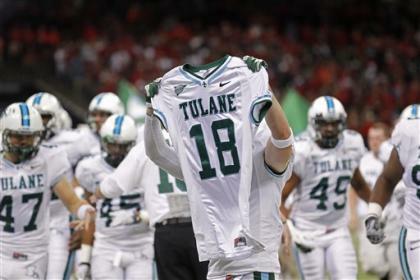 "He represents the best in all of us – what Tulane is and what it stands for," Dickson says. "His persona, his spirit, his accomplishments, his resolve – all those things are captured in Devon." Captured in Devon, and captured by Devon. "They give you the worst-case scenario, but there's always hope," Walker says. "I have all the hope in the world." Devon Walker may spend years living within the walls of this suburban house. But those who know him – really know Devon Walker – know this: He's going to go as far as he can imagine.